I absolutely love weekend style. There's just something about throwing on a pair of distressed jeans + a tank and heading downtown to the farmers market + brunch that I'm totally in love with. There's nothing like spending the day with family and friends exploring your city and making memories. After all, that's what life is all about - the moments in between the moments. P.S. - This adorable hashtag necklace says #lovely - I mean, could you die?! So adorable. Love this look! So chic!! Love that quote, "the moments between the moments.."
Loving the neutral look! Your hair looks amazing. I couldn't agree more about the weekend style. I live in distressed jeans! Also, you look so cute in hats - i'm def not a hat person, but envy those that are! I totally agree! I love weekend style too and you look fantastic! So cute!!! Love this look. I am totally crushing these jeans! They are great! what a fun hat, its perfect for Summer. This looks so easy and comfortable, I adore the hat! Hope you had a great weekend! I absolutely LOVE that bag. Such a great casual outfit!! 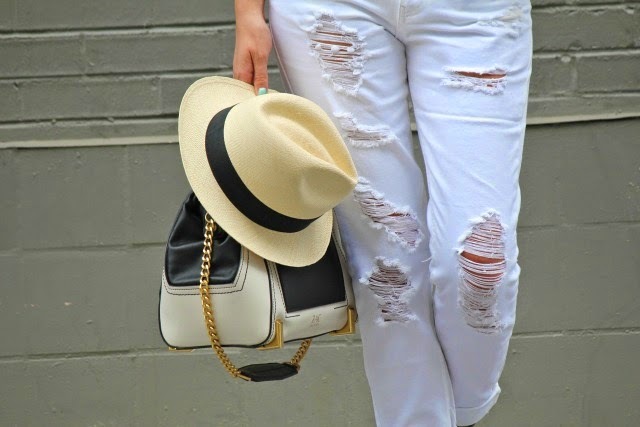 Love the distressed white denim! Love the way you layered the necklaces, added such a nice touch to this casual outfit! Love this casual look. Love the tee and the bag and your hair looks so pretty!